This is where you enter all the charges you plan on billing your clients. These include time worked, products sold, one-time and recurring fees and appointments. The app keeps track of these charges until you’re ready to bill your clients (note: The Billing screen is shown below.) There are 4 formats available to view this information - List, Month, Week and Day. Enter your billable and non-billable expenses. Optionally attach a receipt taken via the camera - or a PDF received via Email. Print or email invoices in seconds. The Billing screen lists all clients that have unbilled charges. 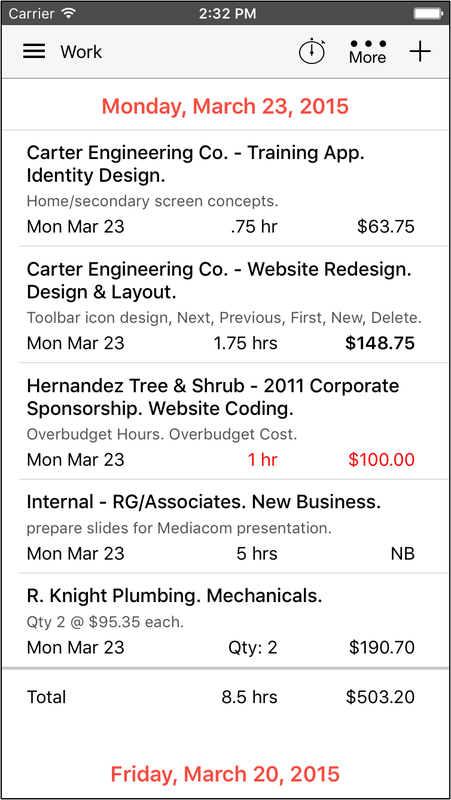 Just tap on a client to preview the invoice, make changes if needed and then email or print the invoice. Sample Invoice using Business Format. Includes business-oriented items such as due date, purchase order number, etc. Sample Invoice with Professional Format. This format is simpler and has fewer fields than the Business format. This would typically be used by a therapist, music teacher, tutor, etc. The Invoice Register shows all invoices that have been created. The list can be sorted by client or month. Invoices on this list can be viewed, printed or emailed. This screen lists invoices which are still unpaid. This screen is also used to enter client payments. Just tap on an invoice and you can mark the invoice paid (partial payments allowed too). Once an invoice is fully paid, it falls off this list. Cash "On Account" - for example a prepayment or deposit can be entered by tapping the '+' located at the top righthand corner of the screen. This screen lists all the payments you've received. If you tap on a payment the app will show which invoice(s) were paid with that receipt. Workbox comes with a full suite of reports. Here's a partial list of the available reports. All reports can be viewed on the screen, emailed or printed. You can format reports as a PDF or as a spresdsheet.